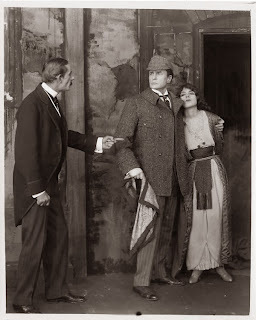 I thought I'd write about the lost films of Sherlock Holmes this week. Last month's Doctor Who finds have shown that nothing is beyond hope. What follows is a list (by no means definitive) of missing Sherlock Holmes films. One of the first adaptations of Sir Arthur Conan Doyle's stories. 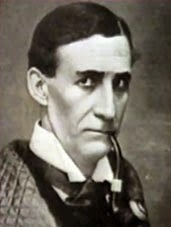 The part of Holmes was played by James Bragington, and diverging slightly from the original story, there was no Doctor Watson. James Bragington was not an actor by trade, he was in fact an auditor employed by the studio and was chosen purely because he looked the part. It is a very sought after film, to the extent that the British Film Institute is actively seeking it due to its historical significance. An adaptation of Conan Doyle's final Sherlock Holmes novel. The film version of 'The Valley of Fear' was released in May 1916, only one year after the original had been serialised in The Strand Magazine. 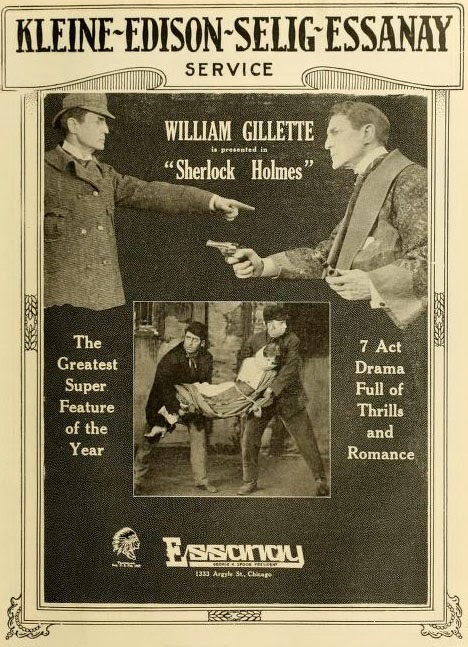 The film starred Sherlock Holmes stalwart Harry Arthur Saintsbury, a veteran of the stage, playing Holmes in his only film credit. An apt title for a lost film if there ever was one. 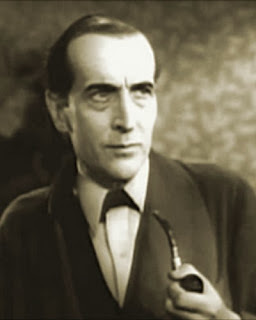 Arthur Wontner played Sherlock Holmes in five "talkies" from 1931 to 1937. 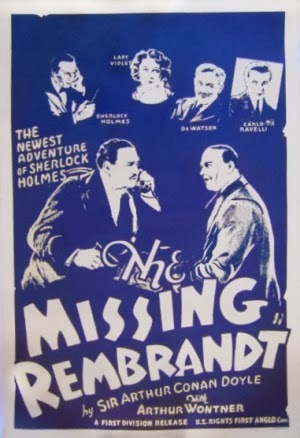 Out of these five films 'The Missing Rembrandt', an adaptation of Conan Doyle's 'Charles Augustus Milverton', is the only one not known to exist. The fate of Silent cinema is sad to say the least, with as little as 20% of the entire output still in existence. The remainder was lost or destroyed for a variety of reasons. Firstly, the nitrate film stock used was highly flammable, and a great deal was destroyed due to safety fears at the onset of WWI, with the metal canisters and spools melted down for the war effort. Secondly, as the "talkies" grew in popularity silent cinema became less and less relevant. Further prints were destroyed when the studios reasoned that the old reels that they had cluttering up their archives were now surplus to requirements, with re-screenings unlikely. The final cull occurred quite accidentally when a fire erupted at the MGM studios in California on the 13th of May 1967. Vault No. 7 was completely destroyed in the course of the blaze, with hundreds of films lost. The most noted of these being Lon Chaney's 1927 film 'London After Midnight'. It is not only the films of Sherlock Holmes that have suffered, television has had its casualties too. 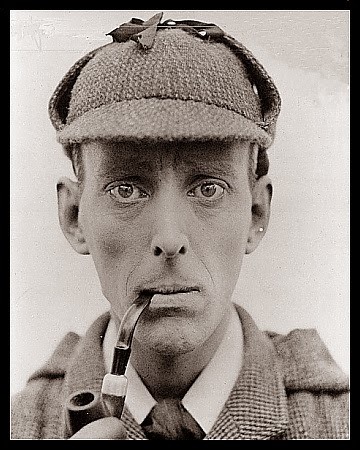 The 1951 BBC series 'Sherlock Holmes' was transmitted live and not recorded, so as a consequence none of the six episodes produced are known to exist. Another lost tale of Sherlock Holmes is the 1953 CBS production of 'The Adventure of the Black Baronet', an adaptation of a story written by Adrian Conan Doyle, Sir Arthur Conan Doyle's son. 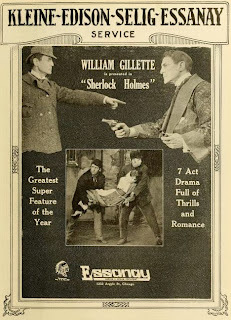 The episode, a pilot for a series that never got commissioned, starred Basil Rathbone in the title role, some seven years after his last Sherlock Holmes film for Universal. Lastly, and most significantly (to my mind at least), we come to the excellent 1968 BBC series starring Peter Cushing as Holmes. Out of the sixteen episodes filmed, only six remain in the archives, depriving us of adaptations of 'The Second Stain', 'The Dancing Men', 'The Greek Interpreter', 'The Naval Treaty', 'The Problem of Thor Bridge', 'The Musgrave Ritual', 'Black Peter', 'Wisteria Lodge', 'Shoscombe Old Place' and 'The Solitary Cyclist'. Hopefully some of the above will resurface one day. After all, John Barrymore's 'Sherlock Holmes' (1922) and Arthur Wontner's 'The Sleeping Cardinal' (1931) were both once considered lost, only to be later rediscovered. What is lost can also be found.